Bill Brooks joined the army in 1968 and claims he was subjected to an alien abduction while serving at the nuclear weapons base at Sennelager, Germany.But this incident was just the tip of the iceberg in a lifetime of contact with extraterrestrials which began when he was a boy.Incredibly he did not realise what had been happening to him until he experienced a “memory download” when he was 44 years old.A professional musician after leaving the army, he claimed to have had an encounter with a UFO when returning from a gig and then just two hours later a flood of memories was triggered – reminding him of seemingly mind-wiped UFO experiences as a child and disturbing encounters in the military. 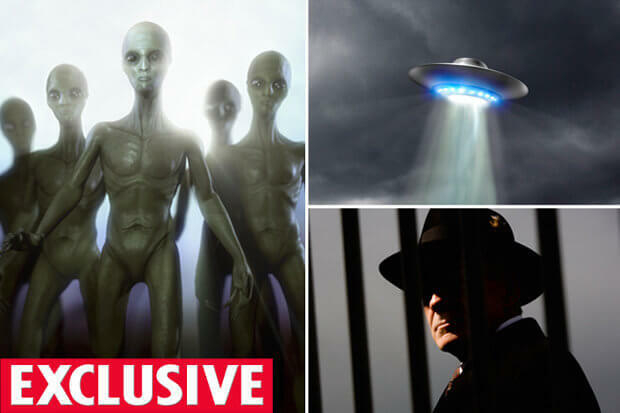 The ex-squaddie revealed he was told the Sennelager base was shared with a detachment of American agents who were from Area 51 – the infamous alien-sighting base.The now 66-year-old claims he witnessed a “mass abduction” event as soldiers on the base walked mesmerised into a bright light.He said he was dozing on top of a Saracen military vehicle when he came too and realised what was happening. The soldier said he was then held at gunpoint by an agent and forced to follow his comrades who were marching in a trance-like state across the base.Brooks described him as a “man dressed in black, with chiseled blonde hair, who probably was American, wearing a little blue patch on his right sleeve”.The man told him “walk towards the light” and cocked his gun, so Bill was left with no choice but to obey – which is the last thing he remembers of that night.When he regained consciousness he was instructed by top military brass not to talk about what he had seen to his comrades or anyone else – being forced to sign a second non-disclosure agreement.Brooks claims he was also subjected to a series of mind-control experiments in the army at secretive government military science base Porton Down near Salisbury.He was claims he was fed mysterious substance on a sugar lump, which he believes was LSD, and began to have psychedelic episodes – he had never used drugs before.The experiments featured a large black spiral moving on a white wall while the two captors shouted out him as he felt he was being drawn into the spinning object. Feelings of hyper-aggression gripped Brooks after the experiments. He believes he unknowingly signed up to the programme after getting into trouble for “scrapping with the lads” and being told if he agreed to join the experiments it would “all go away” and he would get two weeks extra leave. Brooks reveals his lifetime of experiences in his new book called ’44: Based on an Ex-Soldier’s True Story of Life-Long Encounters Involving Alien Abduction’ – which is avaliable now. It was co-authored by alien abductee expert Joanne Summerscales, founder of the ET Newsroom – a UK based project which offers support for experiencers. Summerscales focuses on helping those who have had alien encounters of any kind or who have undergone mind control experiments. She said: “His whole life is incredible. The most amazing thing is someone can live two thirds of their life, until they are 44, without realising what has happened to him. Brooks said he is “really not sure” of the relationship between aliens and world governments, but he thinks those in the know are “frightened of what they can do”.Mr Brooks added: “I only know what has happened to me, and I do feel I’ve been used, and that makes me angry.”The trooper also believes the secret services knew about his experiences with aliens as a child – despite he himself not being aware due to having his mind wiped.When asked if extraterrestrial races pose a threat to mankind, he said “I haven’t got the foggiest idea in reality, but why the secrecy?”. Mr Brooks’ first major encounter with alien life came in 1960 while lying in a crop of corn.The then 10-year-old witnessed the creation of a crop circle before he was approached by a family of four Nordics – tall blonde humanoid aliens which are commonly described by alien abductees.The Nordics told him “Earth was in trouble” and asked “would he help?” before taking him for a ride on their ship.The younger aliens showed him how to use his mind to command movement of small spheres, which he did, and then the adults showed him the propulsion system and tried to explain it to him. He also had a dramatic encounter with grey aliens while working as a truck driver after he had left the army.Brooks was eating fish and chips in his van and preparing to bed down for an overnight stop when he noticed a light in a field – looking over to see a cow being levitated by an alien craft.But when the aliens noticed him, surrounding his van and taking him up through an orange light, passing through the windscreen as if it were not there.When he was aboard the craft he saw the greys were dumping the cow, fearing for his life the one grey told him “No, you’re human”.After being subjected to experimentation aboard the craft, Bill awoke the next day with no memory of what had happened to him.Dumped behind the van, parked in Abingdon, Oxfordshire, was the butchered corpse of a cow – showing trademark signs of the cattle mutilation phenomena which is often linked to alien experimentation.After getting home to his wife, he discovered he had “lost a day” during the incident and had been left without his wedding ring.He also had two implants in his nostril and mouth which he expelled – only for them to disappear during another UFO event the following night.